If you follow Cutting for Business on Facebook, you’ll know that I am obsessed with in love with fonts! 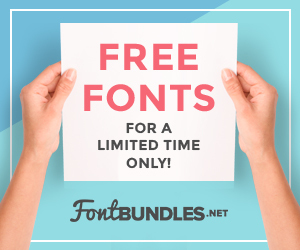 I share both free and paid font deals and am always looking to pass on font related news with readers. Today, I am thrilled to introduce you to Little Big Crafter, a new bundle site offering fonts, clipart, cut files, and more. I’m handing it over to Roemie, co-owner of Little Big Crafter to tell you more about the site. Laura Worthington, the designer behind Samantha, probably the most popular font among crafters, recently wrote an interesting article aimed at font designers, about appealing to the casual-use market. This article highlights an interesting trend where graphic designers are seeking a broader audience and make their work more suitable for the craft and die-cutting market. Currently it seems we are in the golden age of craft design. On sites such as Etsy you can find more work than ever and the amount of new content is growing every day. However, with this extreme growth you also have to be wary when purchasing. You have to ask yourself more and more if these items are high quality, original, not breaking any copyright laws and even if they will work with basic design software such as Silhouette Studio or Cricut Design Space. This is one of the problems we are trying to solve with LittleBigCrafter.com. At Little Big Crafter we work together with Kay Hall from Clever Someday to bring high quality, curated deals. Kay is working with us to get quality designs on the platform. She helps us with guidelines and tells us what we need to look out for when we are curating. Occasionally, she also curates bundles herself. Our aim is to bring these high quality designs together and offer high value deals 100% suitable for crafters. On top of that, we have a clear license structure with our Little Big License which makes it very clear that whatever you buy on our site falls under this liberal commercial license, great if you are cutting for business! With Little Big Crafter you don’t have to worry when shopping for designs online and the only real question you have to ask yourself is: Do I like these designs? For Cutting For Business readers we have a 20% discount on all bundles including our commercial license with the code CFB20 – valid until 31st of April. Are you creating and selling digital content? Contact us at hi@littlebigbundle.com and we can discuss having your content in one of our bundles. Roemie founded Little Big Crafter together with his wife. While running a design and development studio they launched a store for digital designs. When some of the items got picked up by the crafting community the focused shifted more and more into crafting until earlier this year when they decided to focus full-time on the crafts community with LittleBigCrafter.com. Thanks Roemie for stopping in. Cutting for Business readers – get over to Little Big Crafter now and check out their time limited freebies section, $1 Deals, 5 for $5, and bundles. I will have a review of a Little Big Crafter bundle on Monday. Help spread the news by sharing the image below – it’s simple, just hover over it with your mouse. I love Little Big Crafter, uts already become my 1st stop shop for designs. I was lucky to find a link when it first started trading and even luckier to win a prize in their sweepstakesa and have also bought various seamless patterns and Easter designs.